The super-powered Crazy Train marijuana strain grows like a magic beanstalk and delivers crystal-coated buds that will rock your world! It is an exotic combination of Train Wreck, Purple Urkle, Trinity and Space Queen. The tastes vary from melon to blueberry to grape to champagne to skunk to fuel; you never know just what to expect, but it's always very interesting and pleasing. It begins developing huge amounts of crystalline trichromes right away after beginning flowering. Then, about 45 days later, the trichromes will begin turning milky. Harvest then, before they turn overly amber and bring the buzz quality down. a mix of several high-powered strains, great for stress and anxiety relief. 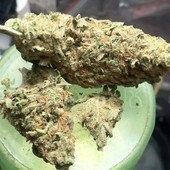 Crazy Train is a mix of some very potent herb! After a bowl i'm flying all around my house! Stuff packs a punch with great flavor. All around great medicine with a great uplifting high. Brings me to a great state while meditating.